The Murray cod is an endemic Murray-Darling finfish which is highly valued for recreational, commercial and conservation purposes. It is highly sought after as a table fish and up until recently has supported a lucrative but otherwise relatively small commercial fishery. 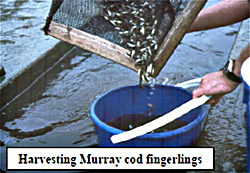 During the late 1970's and early 1980's breeding techniques for Murray cod were established and, as a result, many hundreds of thousands of fingerling Murray cod are now produced in hatcheries annually. These juveniles are used for stocking public and private waterways for both recreational and conservation purposes. 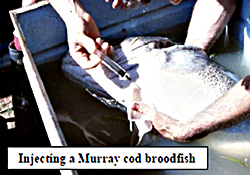 More recently there has been considerable interest (both producers and markets) in the grow-out of Murray cod to satisfy a significant domestic and export demand for human consumption. This trend has been supported, in part, by favourable information on the performance of Murray cod during growout, and the premium and associated ongoing market demand. 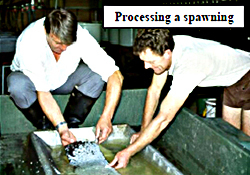 Update the network of persons interested in the aquaculture of Murray cod, especially, farmers and related industry sectors, and state government aquaculture representatives, and other interested groups. 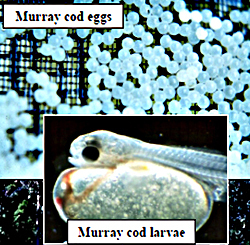 Present results from recent developments in the aquaculture of Murray cod. 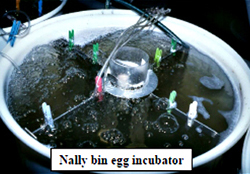 Introduce a new three year project investigating the aquaculture of Murray cod, which is being supported by The Fisheries Research and Development Corporation, the Department of Natural Resources and Environment (Victoria), and the Murray cod aquaculture industry. Initiate steps towards collaborative industry-focused R&D. The organisers wish to thank the Fisheries Research and Development Corporation, the Department of Natural Resources and Environment (Victoria), and the Murray cod aquaculture industry in supporting the preparation of this workshop and proceedings. The assistance of staff at the Marine and Freshwater Sources Institute, Snobs Creek, in particular, Wayne Fulton, Geoff Gooly, Brendan Larkin, Maureen May, Rod Missen, Jenni Dobson, and Stuart Vallis, is greatly appreciated. Department of Natural Resources and Environment, Marine and Freshwater Resources Institute, Victoria. 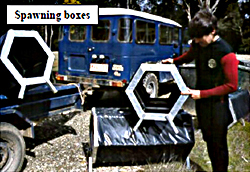 Copies of this document are available from: Marine and Freshwater Resources Institute Private Bag 20 Alexandra. VIC. 3714. This document may be of assistance to you but the State of Victoria and its Officers do not guarantee that the publication is without flaw of any kind, or wholly appropriate for your particular purposes and therefore disclaims all liability for any error, loss or other consequence which may arise from you relying on any information in this publication.